Mother Teresa left us with many inspirational thoughts, but this one really struck me for some reason. I recently attended a Parish Mission at Our Lady of Mount Carmel with Father Ron Hoye. On the night I was able to attend, Fr. Ron talked about discipleship. He asked us to reflect on our own discipleship and specifically asked us to reflect on how we can offer the many beautiful gifts God has given us back to Him. 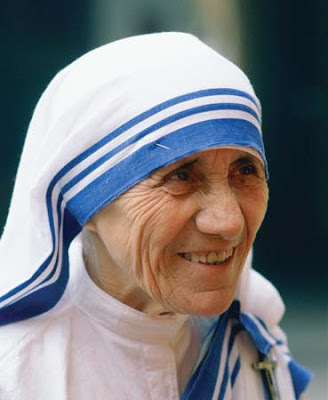 My faith journey has helped me realize that part of being “faithful” as Mother Teresa suggests, is about being “faithful” to my vocation as wife and mother. As Father Ron mentioned during the Parish Mission, God does not ask that we be perfect disciples. There is no such things as the “perfect” marriage or the “perfect” family, but He does ask that we at least try to be his disciples. So what does that mean that I need to be the disciple God has called me to be? How does that alter how I live out my life as wife and mother? I certainly don’t have the answer to those questions and probably never will, but in my simple reflection I keep coming back to one word – love. So, how can I as a wife and mother give back to Christ the beautiful gifts he has given to me? Love. Love my husband. Love my children. Love Christ. Yes. Love! it always comes back to that. None of us is more uniquely gifted at loving (I don’t think), but I do think it’s THE essential ingredient to true discipleship. If we could perfect love – just imagine what marriages (and the world) would be like! Thanks, Sarah!